Your Lifespace II modular furniture can be set up in any of four approved configurations. You may be happy with the current configuration, but if you want to make a change, please review and follow all safety guidelines and assembly instructions. For safety reasons, only the configurations presented here are allowed. You can check out which residence halls and undergraduate apartments have which style of modular furniture here. Steel locking pins are used to connect the various furniture elements are essential for safety. In each configuration, look for the green asterisks in the photo. The green asterisks mark the pin locations. Many of the modular furniture pieces are heavy. Two or more adults are required to lift and stack these pieces. Please do not remove the safety guardrails. Do not remove the smartbar unit from the desk as this may cause a lofted configuration to collapse. The side of the bed without the safety guardrail must be placed against the wall. Please lift carefully. 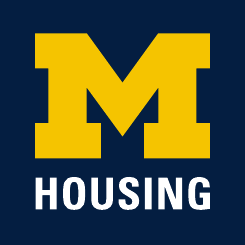 U-M is not liable for injuries you may recieve as a result of configuring your modular furniture system. Decide where you want your loft to be located. Place the desk (with attached smartbar) where you want that end of your loft to be. Place the dresser on the other end of your loft location. Position the bookcase on top of the dresser, making sure that the pinholes in the bottom of the bookcase are aligned with the pins in the dresser top. Turn the bedframe so the safety guardrail will be on the outside of the bed and not against the wall. Lift and place the bedframe on top of the other furniture, with the shortest bedposts facing down (toward the floor). Check all pin connections to ensure that they are secure. Use the ladder to get safely up and down from your loft. Decide where you want your lofted bed to be located. Turn the bed frame so the safety guardrail will be positioned on the outside of the bed and not against the wall. With the shortest bedposts toward the floor, lift and place the bed frame on top of the other furniture, making sure that all pins are properly aligned with the holes in the bedpost. Decide where you want your bunked beds to be located. Position the bottom bunk with the shortest bedposts on the floor. Turn the top bunk’s bedframe so the safety guardrail will be positioned on the outside of the bed and not against the wall. Lift and position the second bunk on top of the first, with the shortest bedposts down (pointing to the floor). Check to be sure that the pins are firmly connecting the two beds at each bedpost. Use the ladder to get safely up and down from the upper bunk. The bed frame for a single bed can be flipped so that either the short or long ends of the bedposts are on the floor. The mattress will fit on either side. Placing the longest bedposts on the floor will provide the most under-bed storages. The safety guardrail should not be removed from the bed. Simply place pins in the pinhole locations to connect the two pieces. Use the track behind the smartbar to manage your computer wires. The smartbar features a universal monitor-mounting bracket so you can get your monitor off your desk and up to eye level.